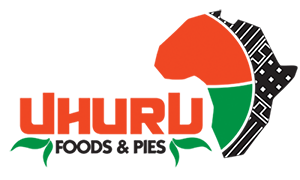 Uhuru Foods & Pies (UFP) is one of the dynamic economic development institutions of Black Star Industries. 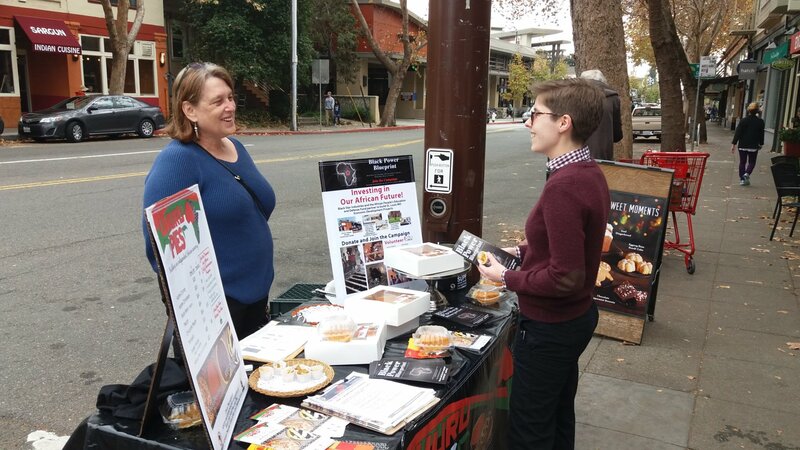 Uhuru Foods & Pies is a popular progressive tradition at Farmers Markets, festivals, street fairs and outside grocery and gift stores where our delicious pies, healthy and tasty breakfasts and mouth-watering festival food have been enjoyed by Bay Area residents for more than three decades. But Uhuru Foods & Pies is about so much more than producing tasty edibles. Named for the Swahili word for “freedom,” Uhuru Foods & Pies is a subsidiary of Black Star Industries (BSI), a black-led self-determination program of the African People’s Socialist Party (APSP), the worldwide organization building for African liberation and unification. This is what makes Uhuru Foods & Pies unique. It’s not just a great pie or breakfast; it’s a cause that forwards the right of African people ourselves to determine our own lives and future, control our own land, resources, food, distribution, and means of production. Uhuru Foods & Pies is not a business owned by an individual, but a part of an independent African economy that African people are building to once again own and control our resources, including our own land, food production and distribution. Reparations is not charity! Reparations acknowledges and rights a wrong financially as well as verbally. In fact, Africa and Africans have been part of someone else’s economy. Now it is past time for Africans to take care of ourselves. BSI will overturn the legacy and verdict of colonialism through the leadership of African working people ourselves. We are changing our conditions, changing the relationships between peoples and thereby changing the world. BSI believes that not one child shall go hungry; not one family shall be homeless; not one youth shall be without a positive future; not one elder shall be disrespected and alone; not one African shall be thrown into prison by a system that makes money from his or her incarceration. On average, white families in the U.S. have more than 22 times the assets of those of African families. White people generally expect to live in tree-lined communities with social services, security and general peace, while African communities are generally characterized by poverty and imposed violence. Corporations, banks, churches and white people who want to overturn the legacy of colonialist and racist relations between white people and Africans, oppressors and the oppressed, can contribute to and support Black Star Industries programs such as Uhuru Foods & Pies as a stand of reparations. Reparations is not charity! Reparations acknowledges and rights a wrong financially as well as verbally. It is a way for white people to participate in and support the African-led movement for economic self-sufficiency and justice. It is in the interest of white people to join this great movement for reparations to create a world in which all humanity works and shares one small planet together, no one at the expense of others. This is the only basis for the end of war and violence and the healing of the planet and all of its inhabitants. Reparations in the hands of Black Star Industries contributes to a new economic foundation for the entire African community. Ultimately Uhuru Foods & Pies is about putting the means to grow, produce and distribute fresh food into the hands of African people. The vision of Uhuru Foods & Pies includes the goal to control our own land, farms, trucking, baking, cooking and distribution of food, none of which African people are currently able to carry out on a large scale inside the U.S., Africa or anywhere in the world today. Made by Black Star Industries, creating economic development and commerce by and between African people worldwide. WANT TO PUT MEANING IN YOUR HOLIDAY SEASON? This November and December, Uhuru Foods & Pies is calling on you to come to Oakland, California and St. Petersburg, Florida to be a part of baking and selling 10,000 Uhuru Pies to support the programs of the Black Power BluePrint. Uhuru Pies is a 37 year old loved progressive tradition in California and Florida. 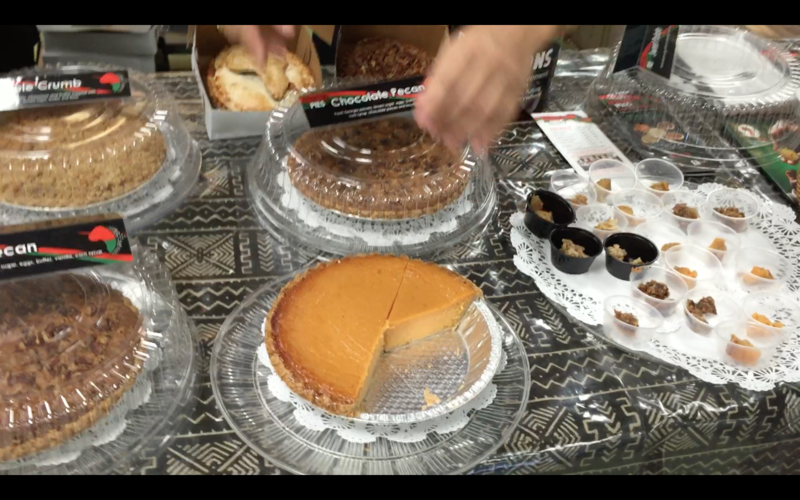 From November 15 – 22 and from December 20 – 24, brigades will meet at the Akwaaba Hall for overviews and summations, be out in the community selling Uhuru Pies, including the signature Uhuru Sweet Potato Pie, baking, phonebanking and winning people to support Black Self-determination and Reparations to Black Power BluePrint. We need you to be a part of selling pies at 12 pop-ups on Thanksgiving Day itself, followed by a Reparations for Black Power BluePrint Dinner at Akwaaba Hall. Don’t miss this opportunity! Get yourself to Oakland or St. Pete. Trainings by webinar begin in October, right after the 7th Party Congress of the African People’s Socialist Party. Ar you already in Oakland or St. Pete? Be a part of the activities now. If you can’t come to us, there’s plenty you can do online or by phone! Sign up now. 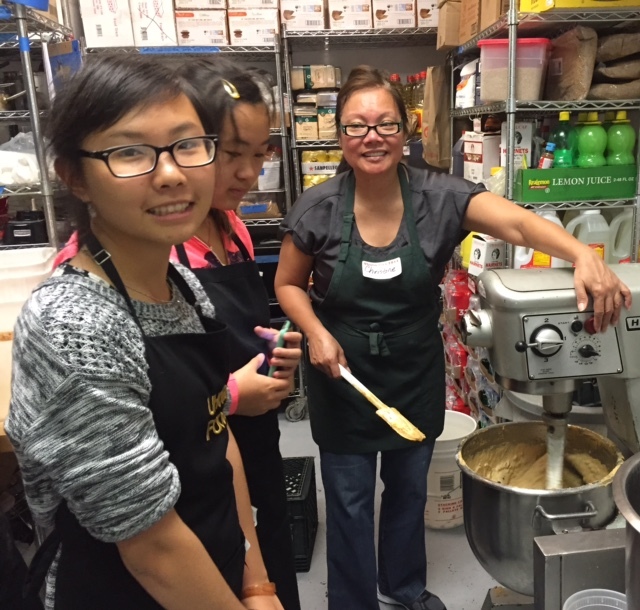 Contact us: oakland@uhurupies.org | 1-800-578-5157. Supporters around the country gave generously to reach the $25,000 crowdfunding goal for Phase I, needed to renovate the three-story St. Louis Uhuru House at 4101 W. Florissant Ave. The Uhuru House is a black community center, event space, rental hall and economic development hub. These contributions helped install the plumbing, heating, HVAC, finish the electrical, the interior and other construction. This vibrant center in the heart of the black community of North St. Louis is now open and alive with weddings, birthday parties, spoken word poetry nights and political conferences. Phase 2 created the outdoor event space next to the Uhuru House! Launched May 5, 2018, Phase 2 raised another $41,000 by the end of 2018. Condemned buildings across the street from the Uhuru House were demolished and the lot prepared for paving, fencing and lighting for the One Africa! One Nation! Community Marketplace and Gary Brooks Community Garden. A 50-foot pole was erected on this land, flying a 25-foot red, black and green African flag. Volunteers also began renovations on an abandoned 4-plex apartment building to house participants of the African Independence Workforce Program. Phase 3.1 launched in January 2019, will raise another $20,000! Phase 3 already completed renovations on the third floor of the Uhuru House for additional office and program space. Insulation and drywall were added, the offices painted, and the floors were beautifully refinished. The wiring, plumbing and flooring are in progress at the four-plex apartment building earmarked for housing for the African Independence Workforce Program, creating jobs for those re-entering our community from the prison system. We will upgrade all bathrooms and kitchens, install stoves, refrigerators, cabinets and fixtures and the apartments will be furnished. Other projects for Phase 3 include architectural plans, new roofing and new windows for the beautiful Jiko Kitchen, located in an art deco building on Goodfellow Boulevard, that had once been a boat dealership. As our most ambitious project so far, Jiko will include a café, bakery, community kitchen and the headquarters of Uhuru Foods and Pies, one of the 26 economic institutions of Black Star Industries and the African People’s Education and Defense Fund around the U.S.